The “Upper Sac” is freestone fishing at its best! The portion of the river commonly called the Upper Sacramento begins below Lake Siskiyou (near the town of Mt. Shasta) and tumbles downstream for nearly 40 miles through canyons and a terraced, typical freestone setting, eventually dumping into Lake Shasta. 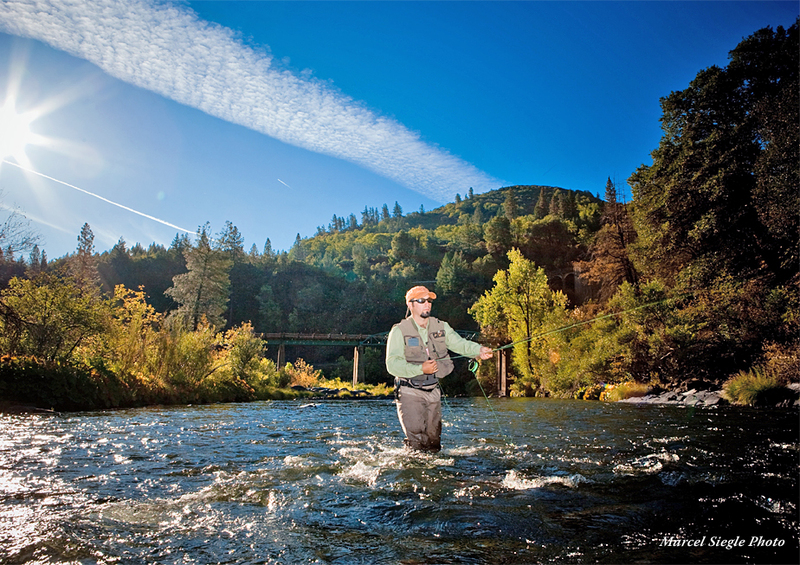 Much of the river is within the Shasta-Trinity National Forest and the Upper Sacramento River can reasonably be called one of the best ‘roadside’ fisheries in the West. Despite having nearly 40 miles of easily accessible water (there are over 15 freeway exits and railroad tracks that parallel the length of the river) the Upper Sacramento River remains surprisingly lightly fished. 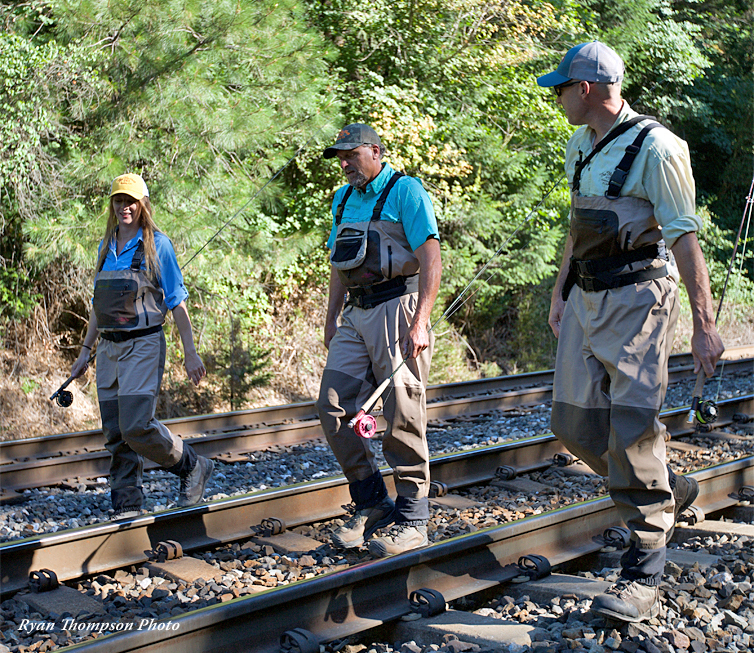 In fact, anglers willing to hike even a mere 10 minutes along the railroad tracks from almost any access spot will find themselves fishing water that remains relatively untouched for most of the year. The river is made up of riffles, runs, pocket water, small holes, huge pools and undercuts, all of which provide anglers with opportunities to fish dry flies, a variety of nymphing techniques, or even streamers, all in a day’s fishing. Rainbow trout are the predominate fish in these waters, and most are healthy, wild, and native to the river system. They are full of fight, and often go straight up in the air when they feel the prick of a fly in their lip. Included in your guided angling package on the Upper Sacramento River is 8-10 hours of guided fishing with lunch provided. If you are just getting started in the sport, or will be traveling and don't want to hassle with dragging along all of your gear, you may want to consider our guide trip "Package Deal." This inclusive option is only an additional $50 per day, and with it the guides will provide the necessary rods, reels, flies, tackle and equipment to ensure that you have the right gear and flies for the day. If you're an experienced angler and/or fly tier, call ahead and we'll let you know exactly what flies are producing so you can be sure to tie them beforehand or bring them along. Regulations were changed a few years ago to allow year 'round fishing on the main stem of Upper Sacramento River from Box Canyon down to Lake Shasta. Late winter and early Spring fishing on the Upper Sacramento, if water conditions and weather cooperate, is terrific. There are hatches of March Brown mayflies and smaller caddisflies that can begin as early as February and run throughout March and April, topped out by PMDs that start in mid-April. Perhaps the biggest draw to this early-season fishery is the huge pteronarcys californica (salmon fly) that begins to hatch as the weather warms in April. 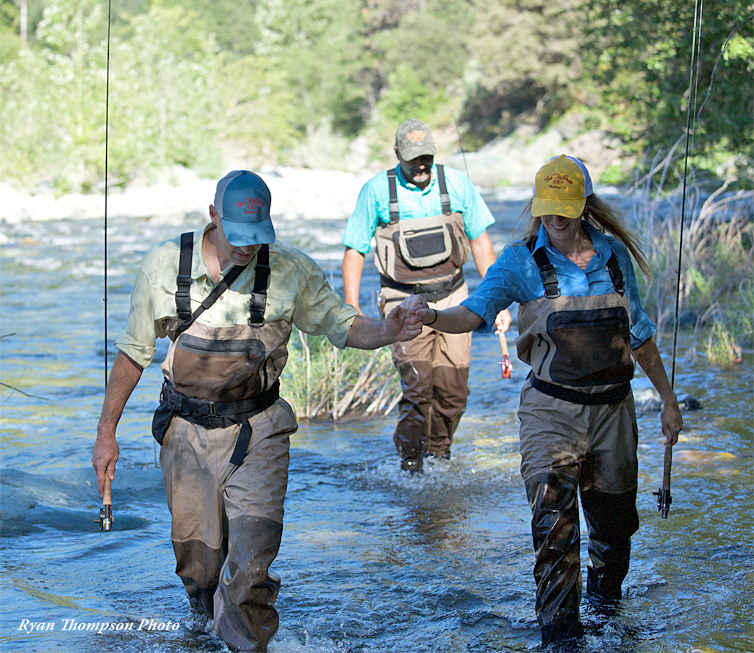 The fishing during these early months is entire dependent upon weather conditions and runoff. During wet winters, the Upper Sacramento can be high and off-color for much of the late winter and spring, making fishing difficult. On dry years, however, the river often remains low and wadeable. It may come up and get off-color after a big storm, but will typically clear with a few days of sunny weather. Those warm, sunny days that mark the start of spring in the North State are also the best for the fishing that time of year. The warm weather gets the bugs moving, and the more bugs are active the more responsive the trout are likely to be. Runoff can impact the Upper Sacramento on most years from the end of April through the start of June. 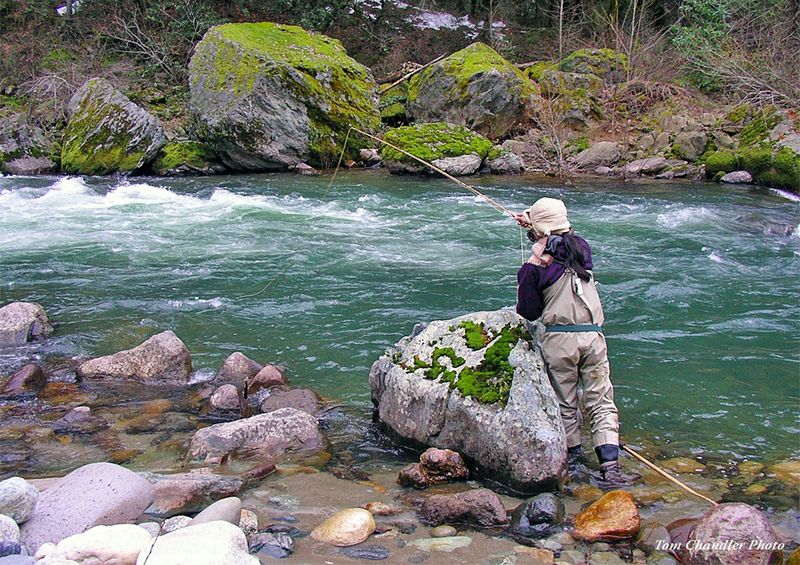 The river remains fishable even in the high-water, with the fish concentrated in the slower moving pockets and pools. This can be a great time of year on the Upper Sac. Wading can be difficult, but anglers generally find masses of fish podded up in certain pools, and some of the most prolific hatches take place this time of year. Salmonflies, Golden Stoneflies, Little Yellow Stoneflies, PMDs, Green Drakes, and caddisflies make up the major hatches during the early summer months, with dozens of smaller mayflies and caddis making appearances as well. There are epic days when you can cast dry flies to rising trout from dawn till dusk. Even if the fish aren't rising, nymphing the deep pools remains effective throughout the middle of the day and the hatches are predictable every evening. The "dog days" of summer are the best time of year to wet-wade the Upper Sac, and highsticking the pocket water and oxygenated pools of the river will produce nice trout throughout the morning and middle of the day, with hatches of Golden Stoneflies and caddis bringing nearly every fish in the river to the surface in the hour or so just before dark. By late July or early August the many submerged boulders on the river begin to turn black with midge larva, providing a new delicacy for the trout from late summer through the fall. Angling traffic on the river is light during the summer months, but it is literally one of our favorite times of year on the river. You will rarely see another angler, and it can be a great time of year to join the 20/20 club (20 inch fish on #20 fly). Autumn brings on the giant October Caddis, as well as the nicest weather of the season. The first of the monstrous October Caddis larvae begin to appear on the rocks and boulders near the edge of the river as early as late August, but by mid September there are literally millions of the inch-long cases decorating the river bottom as they prepare to emerge with the cooler nights of fall. The adult insects hatch at dusk throughout October and November, proving brief flurries of dry fly activity every evening and enticing trout to rise to big attractor patterns sometimes even in the middle of the day. Moreover, they'll eat the larvae and pupae of the caddis like trout candy every hour of the day. On overcast days, there can be some phenomenal blue-winged olive hatches. These tiny mayflies respond to changes in barometric pressure, and hatch whenever a storm front moves through the area, stimulating some great midday dry fly action on all of our regional streams, including the Upper Sacramento, throughout both the fall and winter seasons. The Winter Months on the Upper Sac provides some great late-season opportunities for die-hard trout anglers. The mornings and evenings are often cold in the narrow river canyon, but midday sunshine can warm the river up and provide some good action on nymphs and streamers for some of the river's bigger fish holding in the deeper pools. And anglers fishing the Upper Sac in the winter months should always be prepared with a few blue-winged olive dry flies, as overcast afternoons can have some memorable Baetis mayfly hatches. 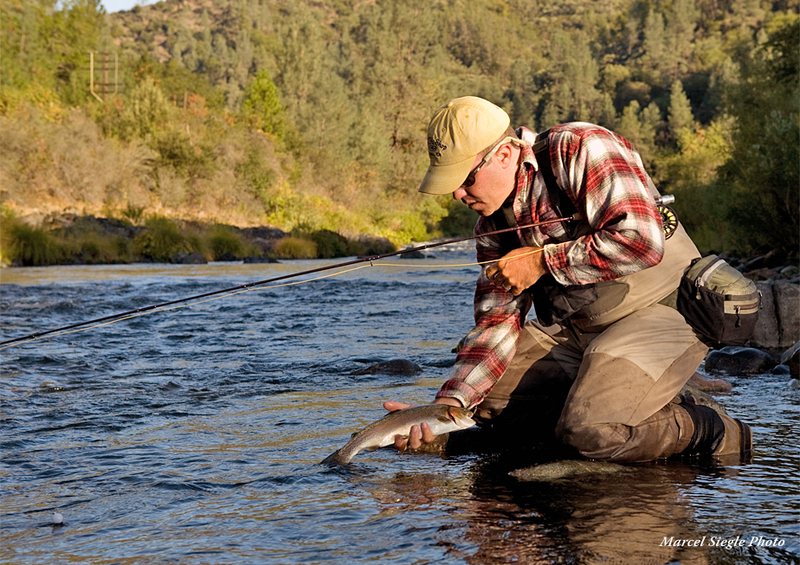 The Upper Sacramento River has been a popular destination for recreation in California since the 1800s, and is still one of our favorite local fisheries. Century health enthusiasts. With many natural mineral springs bubbling up in, near, and around the river's canyons, the headwaters of the Sacramento were believed to help fend off disease as well as rest the mind. 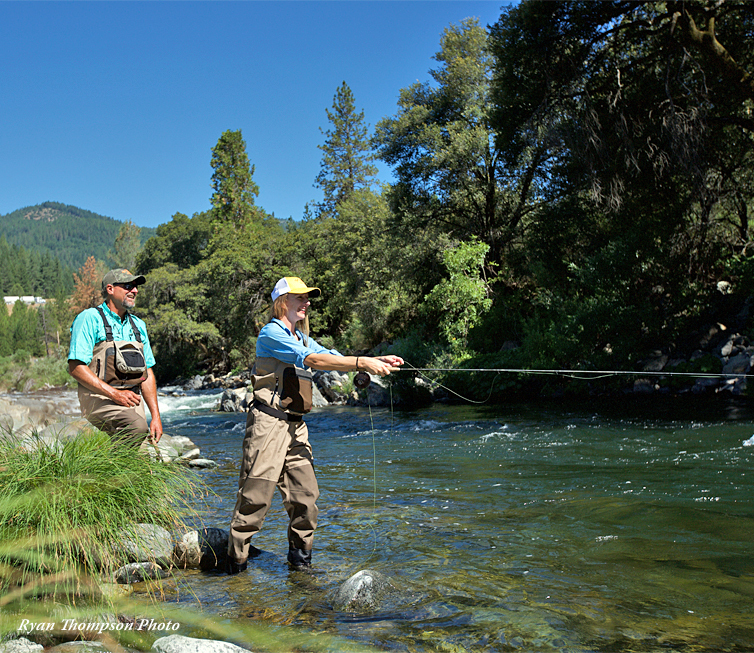 Of course, in the 150+ years since much has changed along the Sacramento, but the trout fishing remains spectacular and continues to draw recreationists to the region. In 1991, the entire Upper Sacramento River watershed received a deadly shock when a train accident caused a chemical tank car to fall into the river, spilling 19,000 gallons of the herbicide metam sodium and killing nearly every living fish and plant in the river. Fortunately, the Upper Sacramento River – in a true testament to the overwhelming power of nature – has recovered remarkably since the spill. Aquatic insect hatches have returned to pre-spill conditions, and anglers fishing the river today will find the fishing for the river's resident rainbow trout to be as good as ever. 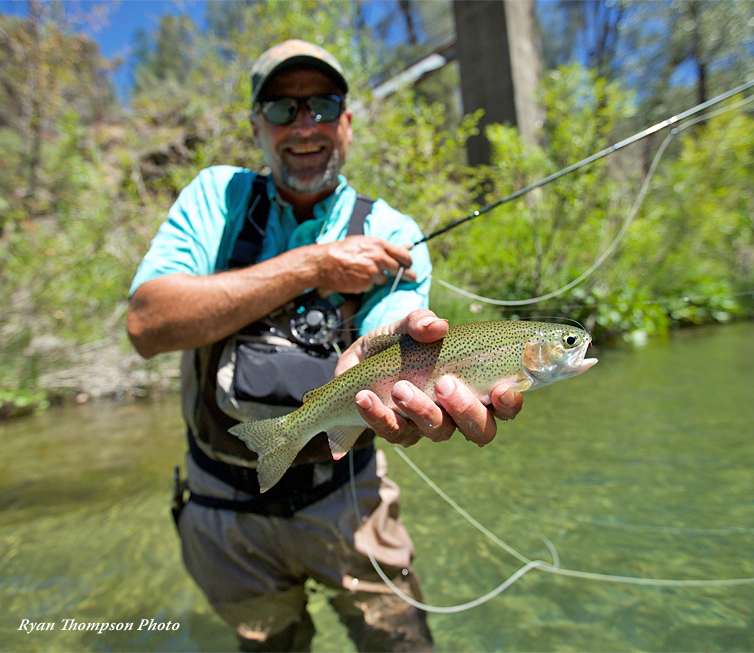 The Upper Sacramento River re-opened to fishing in 1994, and every season since has shown us prolific insect hatches and healthy, hungry rainbow trout in every section of river from Box Canyon downstream to Lake Shasta. The most distant access points (Upper Ney Springs and Cantara Loop) on the Upper Sacramento are about 50 minutes from our front door, and the great fishing in the popular sections above Lake Shasta are only a half an hour away. When our guide staff isn't working hard on the Lower Sacramento River, this is where they spend their fishing time, and some of our guides specialize in fishing this wonderful river. They know the river well, and have figured out the secrets to success for all the different seasons. Despite the easy river access on the Upper Sacramento, utilizing one of our river guides can dramatically increase the learning curve, saving hours of guesswork and frustrating lost time. Our guides are all excellent instructors, so your day on the river will be a great learning experience, not only about the river itself, but also the various techniques that can be successful there. The most distant access points (Upper Ney Springs and Cantara Loop) on the Upper Sacramento are about 50 minutes from The Fly Shop® in Redding. • Railroad Park Resort is a unique experience in its own right, and is one of the most centrally located lodging opportunities on the Upper Sacramento River. 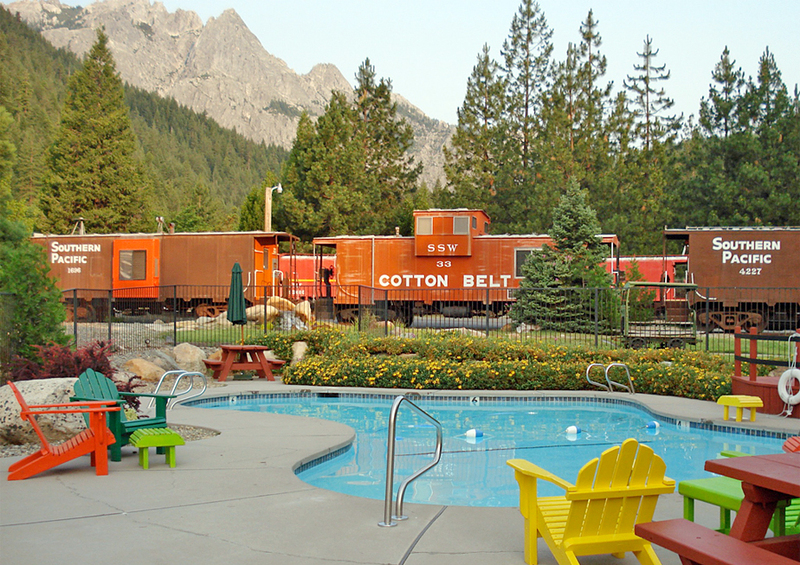 At the Railroad Park Resort you can stay in beautifully restored historic railway cars. The resort also has a good restaurant and options for RV and tent camping. • Cedar Lodge has been a favorite for Upper Sac fly rodders for decades. It's located in the heart of Dunsmuir and just down the road from some great fishing access. • Mt Shasta Resort is nestled in the forest near Lake Siskiyou, and offers privacy and seclusion in their Craftsman-style chalets. Spa and golf course available on-site. 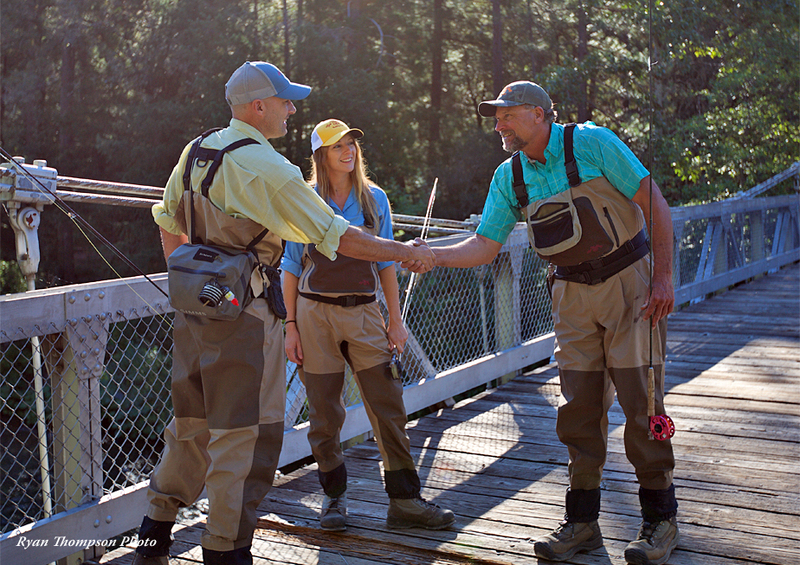 Most Upper Sacramento wade trips will start by meeting your guide either at The Fly Shop® or at Ammirati’s Market in Castella. From Interstate 5, take the Churn Creek Road Exit (Exit #675). Turn east on S. Bonnyview Rd, then turn left (north) onto Churn Creek Rd. Proceed north for ½ mile and you’ll find The Fly Shop® on the left, next to the freeway. Take Interstate-5 North approximately 49 miles. Take Exit # 724 toward Castella (Castella Off-Ramp). Turn Left on Castle Creek Rd. Ammirati’s Market will be on the Left Hand Side, connected to the Chevron gas station. To book a guide, please give us a call at 800-669-3474 during business hours any day of the week, or email us at bryan@theflyshop.com or zmiller@theflyshop.com anytime. We can give you the answers you need, detailed explanations to questions you might have, or check on availability and confirm your reservation in minutes.